It thrived in a parallel universe, hidden in plain sight throughout the antebellum South. Ostensibly founded around 1858 by George W.L. Bickley, a filibustering wannabe and flimflamming medical doctor, the Mystic Order of the Knights of the Golden Circle (KGC) has been intimately linked by author David Keehn with almost every tangled conspiracy, ingenuous plot, and reckless adventure in the Civil War era. Modeled after medieval orders like the Knights of Malta, Knights Templers, and the Masons, local KGC groups were organized into units known as castles. Membership was divided into three degrees. The first was the military arm, the second was the commercial and financial division, and the third was the governing body open only to a few select leaders. The organization had secret initiation rites and meetings, solemn oaths, passwords, and special hand grips allowing members to recognize fellow knights. 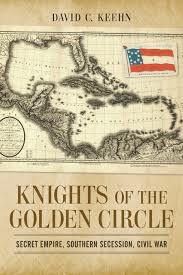 Keehn divides the antebellum activities of the KGC into three periods: filibustering schemes to extend slavery into Mexico, Cuba, and Central America; conspiring with disunionists to facilitate the secession of slave holding states from the Union; and clandestine operations to seize arms and ammunition from Federal installations throughout the South on the eve of the Civil War. He maintains that the KGC's most active years were before the actual outbreak of fighting. During the war, many prominent KGC leaders became officers in the Confederate Army. Members came for all walks of life including the plantation elite, government officials, newspaper editors, merchants, lawyers, doctors, and “all southern men of good character as well as northern men who stood by the constitutional claims of the South.” Keehn uses four state commanders, “military men of substance and drive” as representative of KGC members who later became Confederate officers; Elkanah Bracken Greer from Texas, Paul Jones Semmes from Georgia, Robert Charles Taylor from Maryland, and Virginius Despeaux Groner from Virginia. While these men may not be historically familiar, some KGC “fellow travelers” did achieve more public notoriety. John Wilkes Booth probably joined in 1859. President James Buchanan's Secretary of War leader John Floyd ordered substantial shipments of arms to Southern states ostensibly to support local militias. Cypriano Ferrandini, a Baltimore barber, allegedly organized the plot to assassinate president-elect Abraham Lincoln when he traveled through the city on his way to be inaugurated. Texas Ranger and U.S. Marshall Ben McCulloch played a prominent role in orchestrating Texas's secession. California's first U.S. Senator William Gwin reportedly led 16,000 KGC members on the West Coast determined to form an independent Pacific republic. Former Virginia Governor Henry Wise was involved in plots to seize Harpers Ferry and Fort Monroe. In fact, much of what the KGC might have planned or done remains in the realm of the unknown or at least the unproven. Keehn himself admits “While much has been discovered, it is likely that some things remain unknown due to the loss or destruction of records during the Civil War.” But that's part of their mystique and why secret militant hierarchical organizations remain as much the stuff of legend as they do the stuff of history.